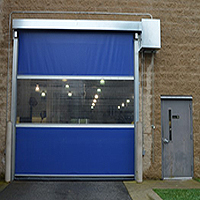 Roll-up Ventilated Doors are a universal solution for providing airflow, Limited visibility, and security protection for large or small service openings (sizes range from 3’ to 30’ width and 6’ to 20’ high). This product is Ideal for such applications in commercial retail, food service and manufacturing environments. The Roll-up ventilated doors are made from a series of horizontal slats with small hole punches. The Roll Up Ventilated Doors consume minimal space and are custom designed to fit the needed application. The door is manufactured with corrosion resistant components for years of trouble-free operation. Optional paint colors are available. Depending on size, the following roll options are available. Manual push-pull, hand crank, pull-chain, motorized with remote control or numbered keypad operator. All doors are shipped as a kit with all necessary parts for a complete install (Less wall fasteners). It is recommended the door installation be completed by an experienced and/or authorized person.